Attention friends and pumpkin enthusiasts: few times have I been more excited to share a recipe with you than I am today. If you’re looking to make a flock of festive little treats that tip their caps to the season while pleasing touchy tummies, these babies are for you. These wee beauties begin with a real food crust that’s just fruit, nuts, coconut oil and some spice to liven it up! That’s all you need. Whirl in your food processor and set aside. Then pop in the freezer and enjoy your creamy little festive “cheesecake” bites a few hours later. They’re creamy, smooth, slightly tart and just taste like a holiday, I don’t know any better way to say it than that! 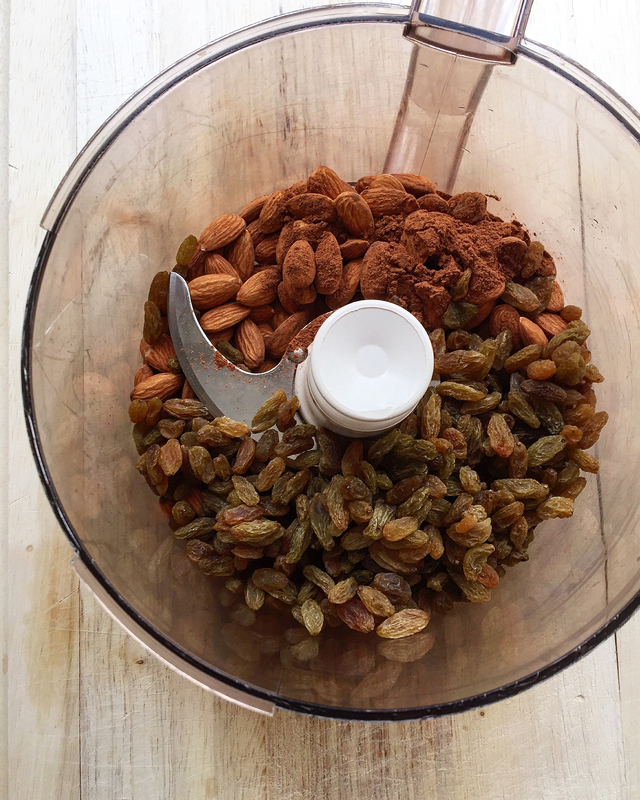 Add crust ingredients to a food processor and blend until it forms a sticky dough. 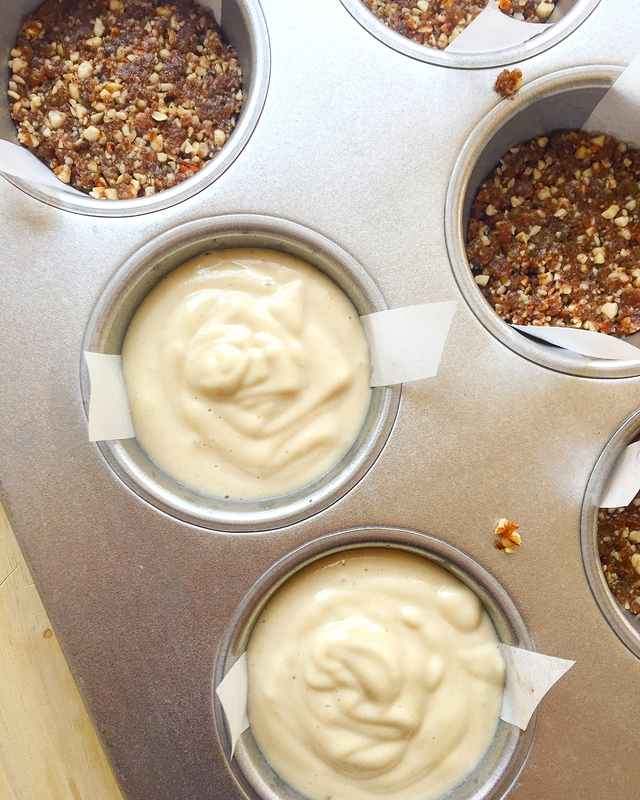 Prepare a muffin tin with thin strips of parchment paper laid in each cup. This creates little tabs that makes removing the cheesecakes from the molds easier once frozen. Divide the crust mixture evenly into the muffin tin cups and press tight and flat with your fingers or the bottom of a drinking glass. Set in the freezer to firm up. Add all filling ingredients to a blender and mix until very smooth (I used a single "smoothie" cycle in my blender). Divide filling evenly over the crusts in the muffin tin. 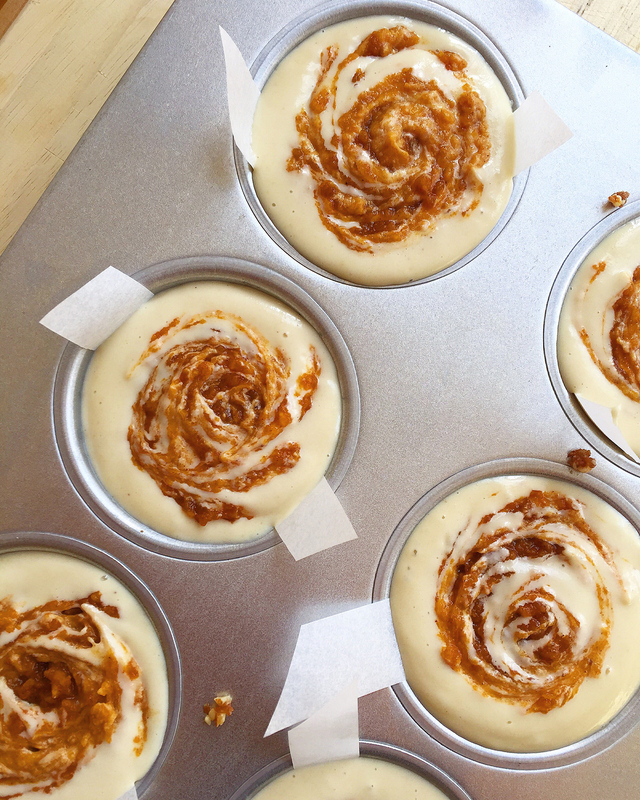 Mix the pumpkin swirl ingredients together, then place a dollop on top of the filling. Using the tip of a cake tester, meat thermometer, chopstick or other pointed implement, swirl the pumpkin mixture down and out into the filling in the pattern of your choice. Freeze until hard, approximately 4-6 hours. Once set, remove by digging a butter knife or other flat pointed implement along the sides of the bites to loosen them. Tug on the tabs to fully remove from the muffin tin. Optional: remove the cheesecakes form the freezer 10 minutes before serving to thaw, if a softer texture is preferred. To quick soak cashews, pour boiling hot water over the cashews, soak for 1 hour uncovered, then drain and use as instructed. Prep time does not include freezing (4-6 hours). These look so good! And so much healthier! Great for dairy-free folks, for sure. Such a yummy and easy recipe!! I have to definitely try this out! OMG yum!!!!! Pumpkin cheesecake? 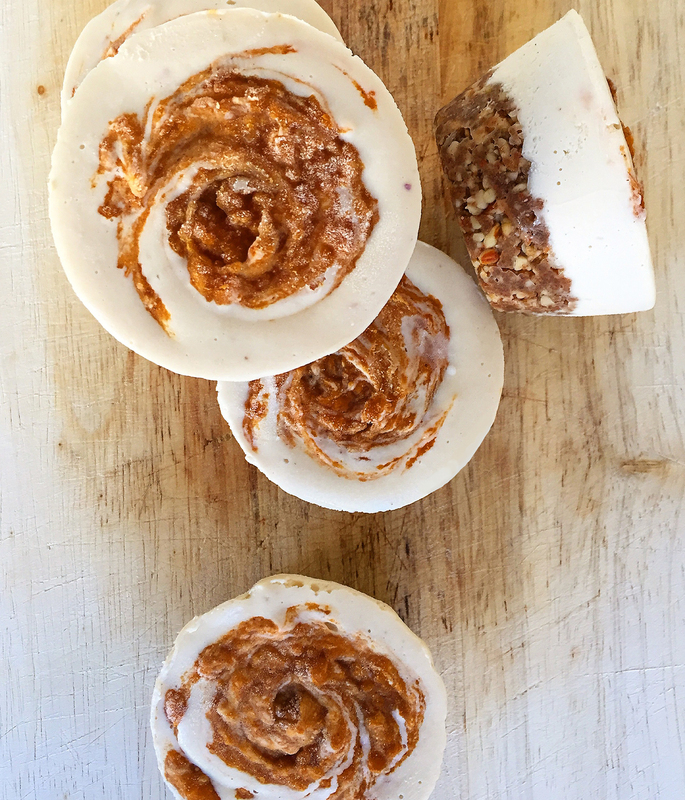 RAW pumpkin cheesecake that is gluten free and dairy free?! YES my hero!!! I just made a raw lemon strawberry cheesecake that was really good. 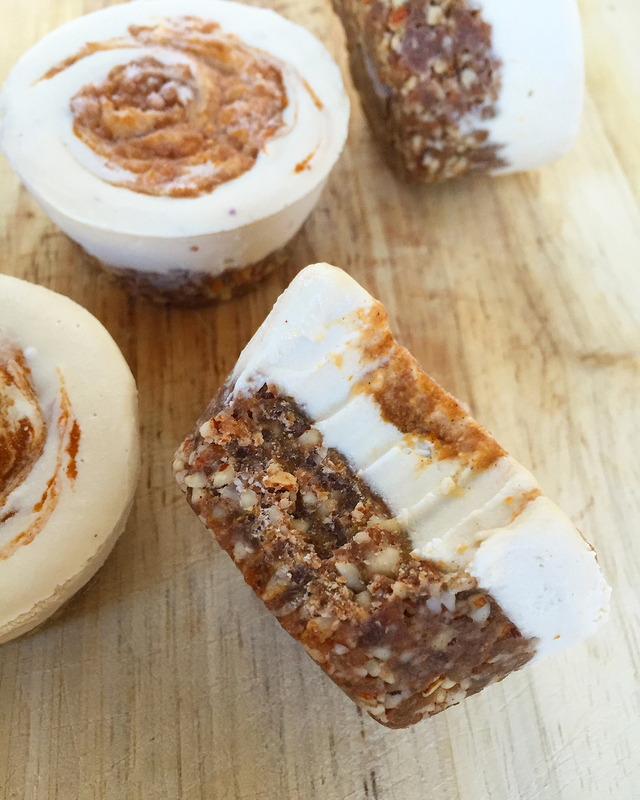 But pumpkin is my ultimate favorite flavor so I will definitely be trying these! Lemon strawberry?! Will have to check that out! I love love love this! Looks amazing and so achievable. Achievable! That’s great. It’s really just loading everything into a food processor and then a blender. This is the recipe and dessert for me. So perfect for a party. 5 stars! A dessert that’s both healthy and delicious, that’s my kind of dessert! These are so beautiful! Pinned and sharing. Yum! Your recipes are always so creative, Rachel! Yum! I love everything pumpkin and cashew! I know, and they make a great combo! Could I use dates instead of raisins? I haven’t personally tried that, it may make your crust freeze a bit harder. Worth a try!